Holy water (Theertham) : Panchakshara Theertham, Athri Theertham, Jamadagni Theertham, Brighu Theertham, Vashishta Theertham, Vyasa Brigandu Theertham. Sacred Tree (Sthala Vriksham) : Mango Tree. Timings : 06:00 a.m. to 12:00 p.m. and from 04:00 p.m. to 08:00 p.m. This is the 5th sthalam on the northern side of river Cauvery. This temple has got the Thiruganasambandar devara pathikam. Mahashivrathri is very devotionally celebrated in the temple in February-March. Lord Shiva graces in the temple as Swayambumurthi. This is considered to be a great mukthi sthalam. Sirkali occupies a place of pride in the religious map of Tamilnadu as the birth place of Saint Tirugnana Sambandar who ably restored the Vedic glory and supremacy of Saivism against the massive assault of other faiths. It also has the added reputation of the Saint merging with Shiva Jyoti with all the devotees gathered there for his wedding at Achalpuram. Noted poet Sekkizhar shows the Saint in his celebrated epic Periapuranam as one small in physical stature but a mount in wisdom. As Achal-Mother, personally attended the wedding of the saint and offered the Vibhuti Prasad to the guests, She is praised as Tiruvennetru Umai Ammai. The place came to be known as Achalpuram. Great sages as Vasishta, Parasara, Jamadagni, Brugu had the Kailash darshan here. Lord Brahmma secured the creation boon from the Lord here, while Vishnu was granted the power of destroying the wicked and demons. Indira had all the luxuries from Lord Shiva at this place. Holy Ganga Devi performed penance at the entrance of the place. Moon was relieved of his curse. Those worshiping in this temple will become free of all adverse effects falling on them. Everyone worshiping Lord who embraced Saint Sambandar through the Shiva Jyoti is sure to awarded total salvation. Sage Kaga was reluctant to tread on this land with his legs and used his head and performed penance sitting in the Nirudhi corner-southwest. Tiruneelakanda Yazhpanar, Muruga Nayanar, Tiruneelanakka Nayanar worshipped Lord in this temple. The history of Saint Tirugnana Sambandar is the very history of Saivism philosophy stressing the ultimate truth that reaching the Lotus feet of Lord Shiva should be purpose of a meaningful human life. Father Shivapada Hrudayar asked the Saint Son to marry which though he refused first but gave in reluctantly thinking it to be the will of Lord. Shivapada Hrudayar chose Poompavai, daughter of Sivanesan Chettiar as his bride. But she died of a snake bite. Tirugnanasambandar restored her to life with the grace of Lord and simply accepted her as his daughter only. Shivapada Hrudayar then chose Mangai Nallal daughter of Nambiandar Nambi of Nallur. The wedding took place at Achalpuram. Tiruneelanakka Nayanar conducted the rituals. Circumambulating the wedding fire pit with his bride, Gnanasambadar prayed to Lord Shiva to protect him from the problems of a marital life and praised Him with Nallur Perumanam hymn. Lord Shiva appeared in the form of Jyothi and advised the saint to join Him along with all gathered there. Losing himself completely to the Lord, Sambandar sang his last Pathigam (10 verses) highlighting the glory of Panchakshara Mantra – Na Ma Shi va ya. All merged with the Lord collectively the same time. This event is celebrated each year in the temple on the Moola Star day in the month of Vaikasi – May-June. Sacred Ash-Vibhuti is the Prasad offered in the temple. Applying this on the body cures the devotee of all illness, frees him/her from sins and poverty and ensures the Mangalya longevity of women, according to belief. Money is essential for every thing and it is the basic thing needed for any one in this materialistic world. Poverty is one of the worst things that puts a brake for every action even if it is going to produce a good thing. If poverty occupies one's life his life will be very difficult as money is one of the deciding factor to achieve name, fame and wealth. 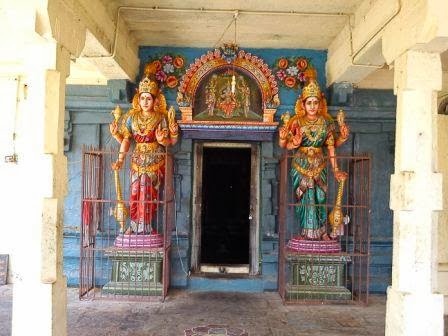 People who's lineage is suffering due to poverty can visit this temple in Aachalpuram in Nagapattinam district. The temple is said to be more than 1000 years old. Thiruneeru is offered as prasadam in Amman temple as it is said to be curing diseases, destroys previous deeds and removes poverty from one's life. Ambal shrine is like a separate temple itself and She too owns a vahana of Nandhi (instead of lion). Large sized Dwarapalakas, made of special sand (Sudhai), are seen both in swami and ambal shrines. The shrine of RUNAVIMOCHANA LINGAM (one who destroys all our debts) is present here. It is present only in three temples. Worshipping Him on Mondays free people from debts. On completion of our circumbulation (prakara vala), a miniature of Narthana Ganapathy is carved in the wall itself. The specialty is a separate temple-like sculpturous work done for Him. Durga with 8 hands is present in this temple. The temple has been renovated in (June 2010). Location: One has to travel on Chidambaram - Sirkazhi road and reach a village called Kollidam after crossing the river Kollidam bridge. 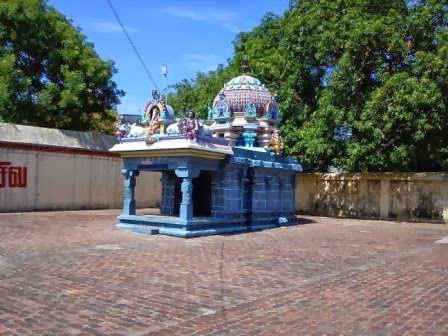 From Kollidam, one has to travel by a branch road that goes to Achalpuram and Tirumayendrapalli.This temple is located 8 Kms from Kollidam at Aachchaalpuram. Bus facilities are available from Chidambaram and Sirkazhi. Aachchaalpuram is about 25 Kms from Chidambaram.